Adventures In Uglyworld: Uglyworld #768 - It IS Like Dark Glass! Uglyworld #768 - It IS Like Dark Glass!, originally uploaded by www.bazpics.com. 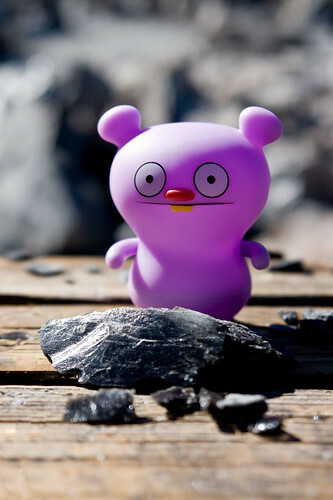 As Trunko walked through the mass of volanic stones that covered so much of the landscape at Newberry Volcano he kept searching for a piece of Obsidian Rock that had been broken into smaller pieces, so that he could check for himself if Babo's knowledge was once again correct (as it always is). Eventually near a viewpoint over the top of the flow itself he found a piece of Obsidian Rock that had been broken into smaller pieces and started holding it up to the sun to check if it was in fact see-through. "Wowzers, it IS like darks glass!" he exclaimed to which all the other guys came over to check it out for themselves too, with Babo nodding his head slowly in a "told you so" movement.